Jack is a Black-Tailed Jackrabbit (Lepus californicus). Jackrabbits are associated with desert areas, but are found all over the southwestern United States and into Mexico. To introduce the Big Bend area to the reader, I made Jack an involuntary transplant from elsewhere, since there are so many other places he could be from. Jackrabbits are not actually rabbits, but hares. What's the difference? Well, umm, rabbits are born with their eyes closed, and hares are born with their eyes open, for one thing. Jackrabbits don't burrow (see Episode 13), but live above ground, sleeping in forms, or roughly jackrabbit-sized depressions in the grass or dirt. They are also eaten by just about every predator big enough (or fast enough) to take them down (see Episode 1, and Episodes 4 and 5 for how this fact has slightly warped Jack's thinking). Their strategies for avoiding predation are: listening with their big, sensitive ears; running in a swift zig-zag pattern (see Episode 3); and hiding in forbidding growths of thorny plants (see Episode 37). Jackrabbits are largely nocturnal, like most desert mammals, though they are also active around dusk and early morning. They are not particularly territorial, unlike a lot of other species, nor are they overly social, though they may feed in small groups. 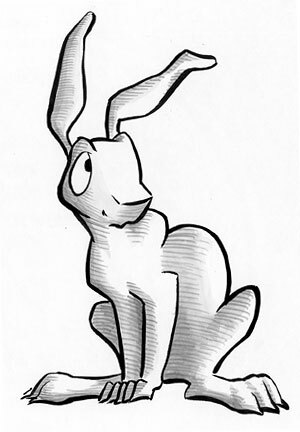 In the folklore of some cultures, rabbits occasionally take on a trickster role (see Episode 10), though not nearly as often as Coyote.